Animal organs. Nervous system. Hypothalamus. Atlas of plant and animal histology. The hypothalamus is a relatively small region that is topographically located ventral to the prethalamus. That is why the name hypothalamus and why it has been traditionally included as part of the diencephalon. However, that position is the result of the bending of neural tube during the embryonic development. Actually, topologically, the hypothalamus is rostral to the diencephalon, more precisely to the p3 diencephalic region. 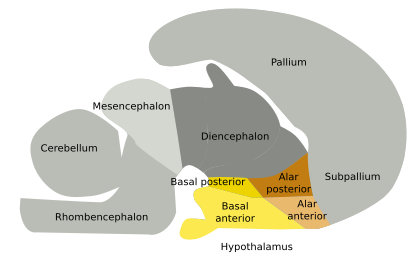 The hypothalamus is divided in alar and basal plates. The basal plate is subdivided in a caudal part containing the mamillar region and a rostral part or infundibular that originates the neurohypophisis. 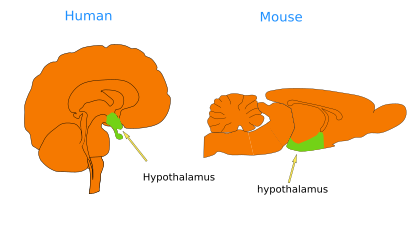 The hypothalamic alar plate is rostral to the prethalamus, and in the caudal part contains the paraventricular areas, whereas in the rostral part there is the supraoptic area. Regions and location of the hypothalamus in a non completely developed encephalon. The hypothalamus is involved in several functions like hunger, thirst, circadian rhythm, body temperature, reproduction, sexual behavior, emotions, and much more. Unlike other nervous region that communicate with the body through motoneurons and muscles, hypothalamus does not innervate muscles, but communicates with the rest of the body by releasing molecules, known as hormones, to the blood vessels. This happens mostly at the neurohypophysis. The hormones release occurs after the integration of very different types of information coming to the hypothalamus from diverse sources, such as eyes or those encephalic areas that send axon projections to hypothalamic areas. Oxytocin, vasopressin, growth releasing hormone, gonadotropin releasing hormone, and many others, are hormones released by the hypothalamus.